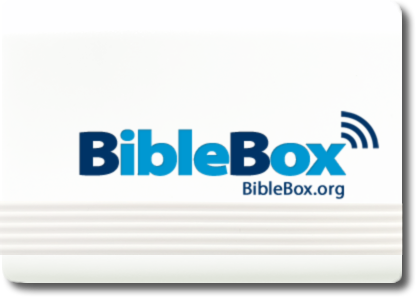 The BibleBox is a device enabling the wifi delivery of Bibles and Christian resources to share the Good News of Jesus Christ and support Christian growth. It is a platform from which you can distribute courses, multimedia, apk files and other digital resources to wifi enabled devices. These days people in every country carry with them a wifi enabled device – phone, laptop or tablet. But they may or may not have access to the internet and data. 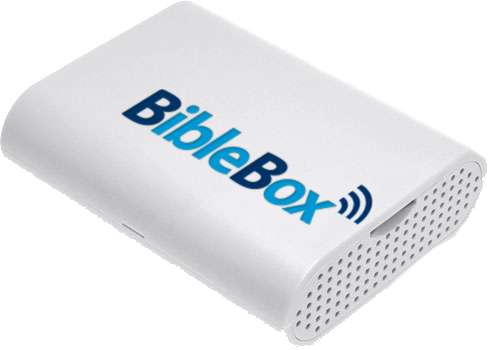 The BibleBox is a cheap, simple wireless device to share a collection of digital wifi Bible multimedia resources to users of wifi enabled devices. You may be in a Cairns cafe, a church in Jakarta, an apartment building in Nairobi, a jungle village in Papua New Guinea or an office block in New York – whatever your location you can turn on the BibleBox and share digital resources to those around you. There are millions of people in developing countries who do not have access to the incredible amount of digital Bible resources freely available to anyone with internet access. In the developed world, Christians with internet access can easily download free digital wifi Bibles, subscribe to sermons and podcasts on their mobile phones, install apps for multiple Bible versions and scripture memory tools, install apps which can be used for outreach and discipleship. Many of us live in a space where access to these tools – many of which are free – is taken for granted. Yet in the developing world there is a gap. There are people with wifi enabled devices and opportunity to disciple and mentor other Christians, but they do not have access to the internet or to Biblical material and training resources. The BibleBox helps to remove that gap. It also makes it possible for us to share media about Christ in our technology rich environments. In Australian airports, cafes, shopping centres, anywhere people congregate, there are usually many people on smartphones checking in to a social media site or news or email. Placing a BibleBox into that space creates the opportunity for others to access a wifi Bible and Christian media which God can impact their hearts with. A church pastor wants his congregation to have access to a set of digital resources on a Sunday morning, but not access to the internet so that email and Facebook become distractions. He sets up a BibleBox in the church and provides access to a wifi Bible and other digital resources for any wifi users. Those on the wifi begin discussing anonymously points the pastor is making during his sermon using the BibleBox web chat feature. 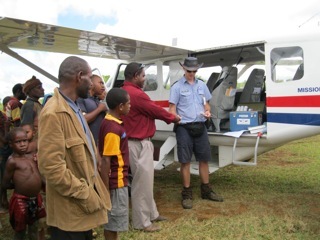 Pilots with Mission Aviation Fellowship live and work amongst some of the worlds most isolated people groups. These pilots fly in and out of isolated communities where people have lived for centuries without access to schools, universities, Bible colleges, training pastors. 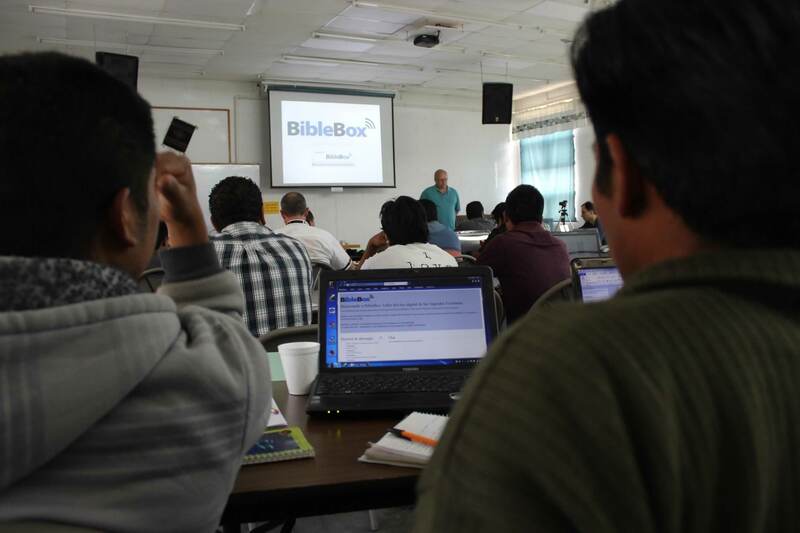 Equipped with a BibleBox a pilot can provide a local leader or church pastor who has a wifi enabled device, learning and discipleship resources. A Christian field worker travels from the city to more remote areas of her region to meet with local church members and leaders. 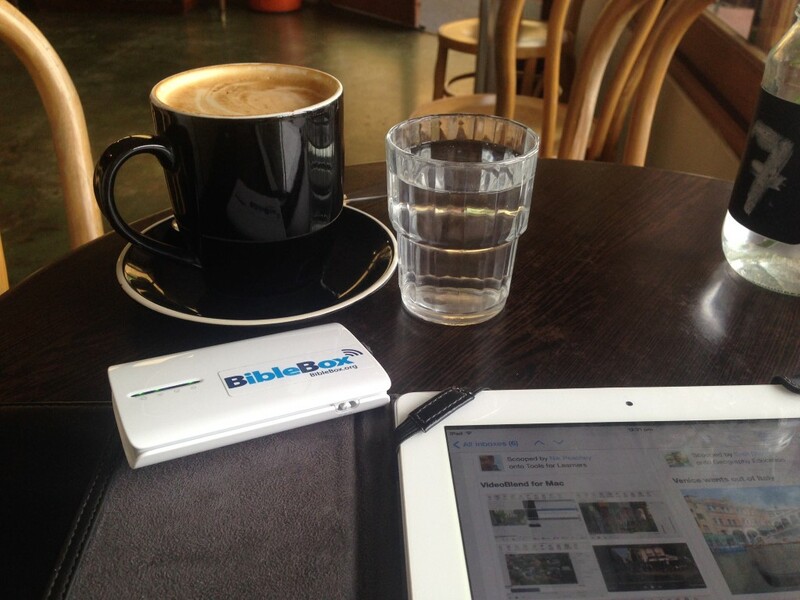 She takes with her a fully charged BibleBox to the various meetings where resources are made available and downloaded to Android smartphones and tablets. The church leaders and members then share them through their device with others in their local villages, making Bible teaching more available and frequent. Missionary families living in remote communities can have a BibleBox sitting on a window sill of their house or office making Bibles and learning resources available simply by having it turned on. Nothing else is required. 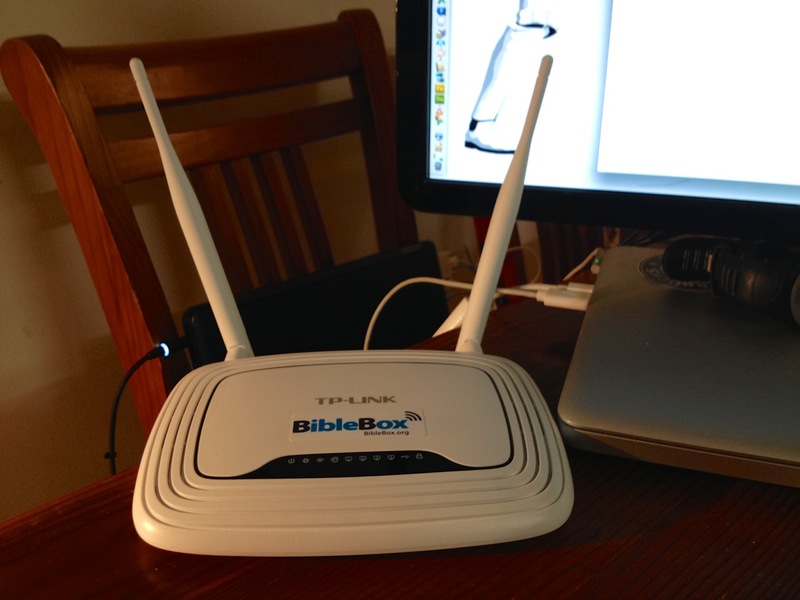 Once the device is on anyone with a wifi enabled device simply connects to the BibleBox and can download the shared files. A businessman waiting for yet another flight connects to the airport wifi to check and send his email. While he is waiting for his flight he switches on his BibleBox and makes 100’s of audio sermons available to anyone who connects to his free, secure and private BibleBox wifi. A Christian in a country with limited or restricted access to Bible teaching sits in a park with her BibleBox wifi active. She can privately and securely make wifi Bible sermons on video available to those connected to the BibleBox wifi. A Christian in an apartment complex in Bangladesh uses his BibleBox to share Christian resources anonymously with others in his complex. They share resources and can even chat online using the BibleBox software out of sight to answer any questions or discuss issues. An office worker on his daily commute to work on public transport uses a BibleBox on the train to make evangelistic resources available over the BibleBox wifi link to anyone who connects to it. In private. A Christian store owner uses a BibleBox in his store to make available Christian digital resources to his customers. A Taxi driver makes Christian resources available to passengers as they journey with him. A Foodcourt Cleaner keeps one secure in his cleaning cart during the day plugged into an external battery pack so he has power for his entire shift. 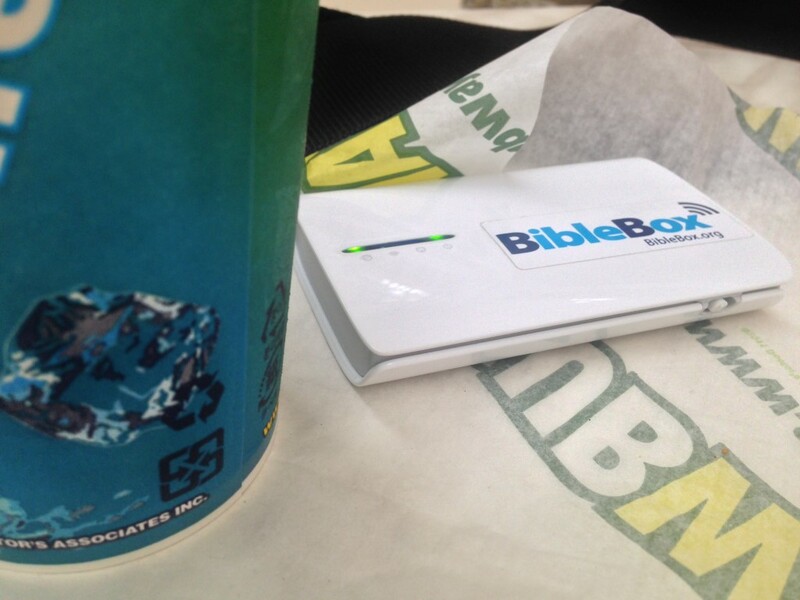 Patrons at the foodcourt discover the BibleBox wifi and the resources he is sharing, with regulars often accessing the short videos he makes available while on their breaks.